FGC BOLSA - FGC FINANCIAL MARKETS INFO: Markets I WSJ: Institutional Investors Avoid Tobacco, Weapons Securities. Markets I WSJ: Institutional Investors Avoid Tobacco, Weapons Securities. Good morning. I'm Gunjan Banerji, your guide to the markets this morning. U.S. stock markets will close at 1 p.m. today, so enjoy the shortened day. The S&P 500 notched gains on Wednesday but is still on track for weekly losses, the first during a Thanksgiving week since 2011. This morning, oil prices and equity futures are down. Plus, our Matt Wirz will dive into how some big investors are shunning investments tied to tobacco and weapons. Global stocks were mixed, as European indexes gained while Chinese shares dropped amid persistent trade tensions with the U.S.
U.S. institutional investors are increasingly screening out securities tied to tobacco and weapons production, cordoning off $4 trillion of investment assets from the two industries, according to a new study. The institutions, primarily pension funds and insurers, placed so-called ESG screens against $2.56 trillion of tobacco-related securities, more than doubling the $1.16 trillion that was similarly restricted in 2016, according to findings by US SIF, an organization that promotes sustainable and responsible investing. ESG stands for environmental, social and governance practices. Disclosed restrictions on arms-related investments climbed 78% to $1.45 trillion of investable assets from $845 billion over the same time period. The increases in blocks against investing in tobacco and weapons-related securities helped make product-specific restrictions the fastest-growing type of ESG investments. ESG principles have become a hot topic in investment circles, with some portfolio managers touting them as a way to reduce risk without sacrificing returns by betting on companies and governments that employ sustainable and ethical policies. But ESG investing also has a history of employing a more aggressive tactic: Investment bans—often called negative filters—like the anti-apartheid divestiture campaign of the 1980s. 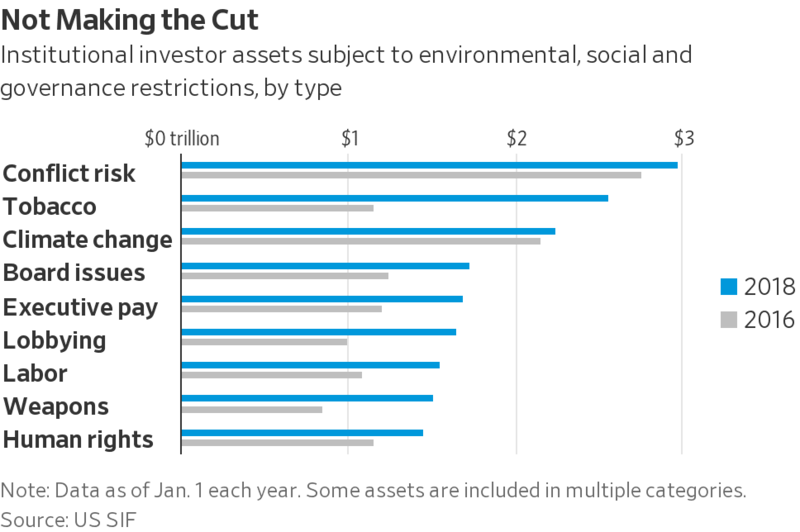 Total assets invested using ESG principles, often overlapping in the same portfolio, grew 38% to $12 trillion in January of this year from $8.7 trillion in 2016, according to the US SIF study. The figure, which includes money managers as well as institutional investors, represents about one quarter of all professionally managed assets in the U.S.
Institutional investors included in the study also placed restrictions on assets worth $1.65 trillion, prohibiting their investment in companies engaged in political campaign spending and lobbying. That figure was up by 65% from 2016. It is hard to tell whether insurers and pensions are applying more bans on tobacco and weapons investing, or are increasingly reporting previously undisclosed restrictions, says Meg Voorhees, director of research at US SIF. What is clear is that institutions are increasingly communicating their commitment to ESG principles to address concerns of their investors and stakeholders, she said. After mass shootings in Las Vegas and Parkland, Fla. prompted national outcry, “a number of public funds and other institutional investors reviewed their investment portfolios’ weapons holdings and established policies to divest from gun manufacturers,” the study found. Institutions now divesting from arms makers include some of the largest in the nation, such as California’s public employees’ and teachers’ pension funds, Chicago teachers’ pension funds and New York City’s employee pension funds. Do you think investors will continue to screen for tobacco and weapons securities? Let the author know your thoughts at matthieu.wirz@wsj.com. Emailed comments may be edited before publication in future newsletters, and please make sure to include your name and location. The Composite Purchasing Managers' Index is released at 9:45 a.m. ET, providing an early estimate of private sector output. U.S. stock exchanges close at 1:00 p.m. The Fed's balance sheet is released at 4:30 p.m. The global selloff is testing a changed credit market. Corporate bonds have taken a beating in November, adding to an already difficult year for a market that thrived in an era of ultra-easy money. A retreat of smaller lenders is adding pressure to housing. Small and midsize U.S. mortgage firms are trimming staff, putting themselves up for sale and closing up shop at a clip not seen in years, a sign of the pressure on the housing market as interest rates rise. Trouble is brewing for Louis Dreyfus’s coffee trading. Intercontinental Exchange has suspended three Louis Dreyfus-owned coffee warehouses in Europe for violating unspecified “grading” procedures. Goldman Sachs is being sued over its “central role” in the 1MDB scandal. An Abu Dhabi sovereign-wealth fund accused Goldman of enabling bribes to former top executives at the fund. The U.S. is urging its allies to shun Huawei. The U.S. government has launched an outreach campaign to foreign allies to persuade wireless and internet providers to shun telecom equipment from China’s Huawei, people familiar with the situation say. Freeport-McMoRan Inc.: The mining company's shares rose 5% on Wednesday as copper prices edged higher. Copper prices have risen in six of the past seven sessions. Deere & Co.: The manufacturer's stock jumped 2% on Wednesday after it revealed that revenues grew in the fourth quarter, lifted by farm machinery and construction-equipment sales. Facebook Inc.: Mark Zuckerberg recently responded to the controversies circling the social media giant in a television interview. 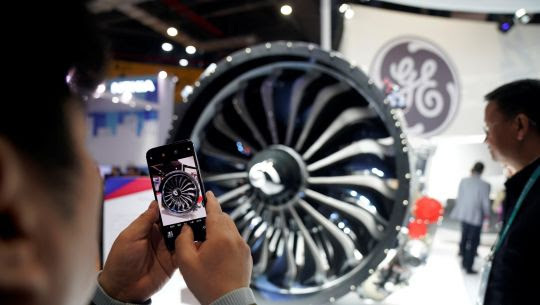 The chief executive said that he doesn't plan to step down as chairman in the near term.